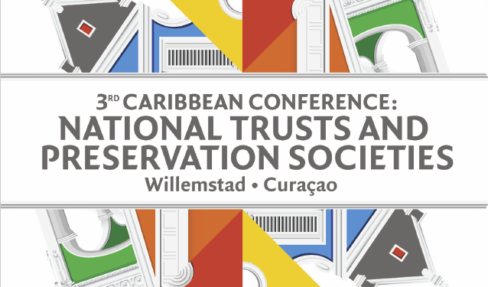 On behalf of the Monuments Platform, consisting of the Curaçao Monuments Foundation, the Curaçao Monument Fund Foundation and several other partners, we welcome you to the 3rd Caribbean Conference of National Trust & Preservation Societies. Informal Welcome Reception at the Riffort Wall. Please enter through the Renaissance beach area to access the fort wall. Gather in the lobby. Please wear comfortable shoes, light clothing and sun protection. A bottle of water will be provided upon departure. lunch for more information or questions. Anne Witsenburg | Financing Heritage Conservation in Aruba: How to survive without subsidy? The buses will depart from the lobby at 5:10pm for a sunset cocktail at Fort Nassau. At 6:30pm we will arrive at Landhuis Bloemhof for a dinner reception and art exhibition at this historical plantation house. The buses will depart from there at 8:30pm to return to the hotel. > Gather in the lobby. Please wear comfortable shoes, light clothing and sun protection. A bottle of water will be provided upon departure. We will depart from the lobby at 5:45pm for a short walk down the waterfront to a beautiful 18th century building for dinner, with an amazing view on the harbor and floating bridge. For those who want to keep going, after dinner drinks in town on own are strongly recommended at the Pietermaai district.